The Golden Profiler Instructions - Executive Leader Coach @ dbkAssociates, Inc. : Executive Leader Coach @ dbkAssociates, Inc. Thank you for participating in the Golden Profiler. This is an important step in understanding your personal growth and leadership journey. 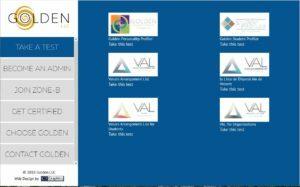 Golden LLC – a pioneer in the assessment industry for 60 years. Rev. Dr. Edward S Golden founded the North East Career Center at Princeton Theological Seminary in the 1960’s offering assessment series for clergy and staff seeking career direction and guidance. He then founded Organizational Renewal Associates, Inc. (ORA) in 1971 to expand the career assessment benefits to organizations across the globe. In 1990’s, under the leadership of Ed’s son Dr. John Patrick Golden, ORA shifted its mission to include developing, researching its own proprietary line of assessments. In 2004, ORA restructured its business model to focus exclusively on publishing assessments as Golden LLC. 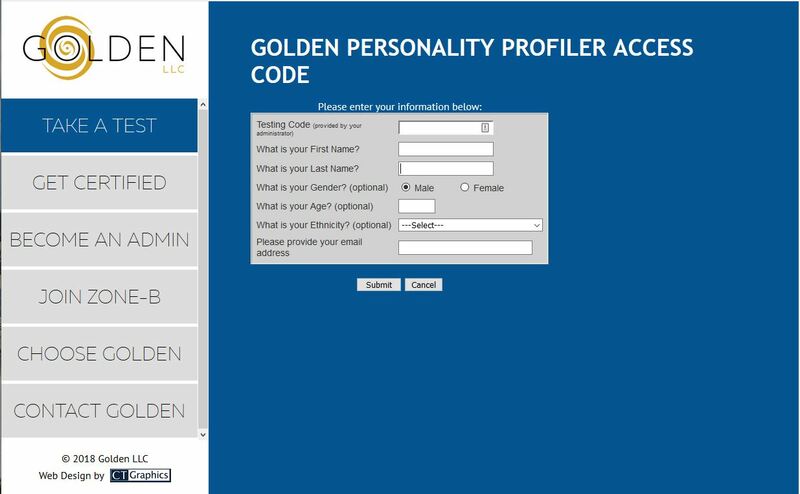 (1) The first step is to go to the Golden LLC website. Choose “Take a Test” from the front page. 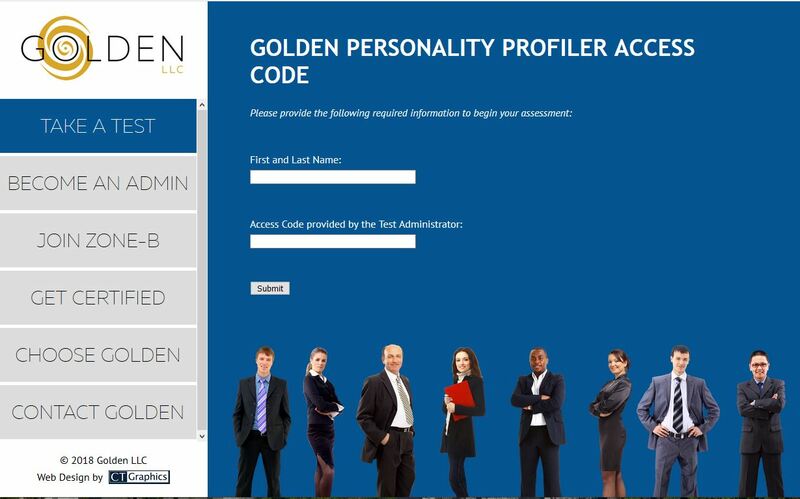 Then choose the Golden Personality Profiler (upper left in this image). 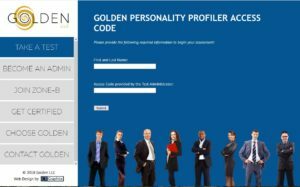 Select the Personality Profiler test. 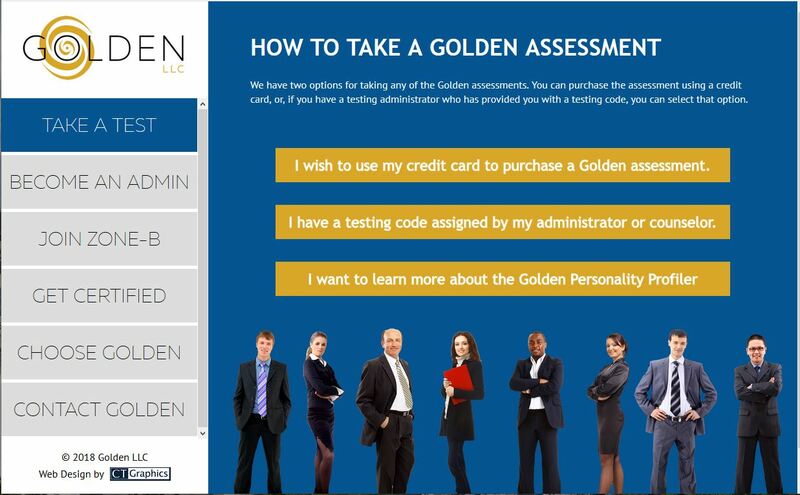 (2) Next you will be asked to select how to “purchase” the Golden Assessment. 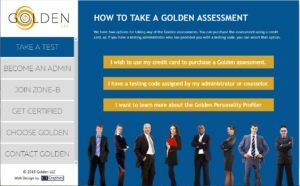 Please take the “Use a Code” option for your assessment. (3) Enter your first and last name as well as the code that you were given in the email sent to you. Click “Submit” when done. (5) Complete the Test Header as appropriate. Click on the “Submit” button when completed. (6) Carefully read the instructions on the next page, click the “I have read . . . ” check box, and then the “Continue” button when ready. Please make sure you have time to complete the assessment in one sitting if at all possible. Remember, there are no “right” answers. There are only your answers, and it is best to be as honest with yourself as possible. Also, do not ponder too long on the questions. Your initial response will most often be the most accurate for you. After completing the assessment, I will receive a notification that the results are ready. Once I have received your assessment, we will schedule a time to review and discuss it together. It is likely that I will email you a copy prior to our meeting. Depending on our prior arrangements, you may receive and invoice from dbkAssociates, Inc. for the assessment, or it may be included in the coaching contract upon which we agreed.